The GRIN2A triple. The idiopathic focal epilepsies are a group of childhood seizure disorders ranging from mild, self-limiting rolandic epilepsy to severe epileptic encephalopathies. The EEG feature of sharp-slow waves originating from the rolandic region is the unifying feature. As the rolandic region is part of the brain regions involved in speech production, acquired aphasia, i.e. loss of speech, can be a prominent feature in some patients. A strong genetic contribution in idiopathic focal epilepsies is assumed, but the genes involved have remained largely elusive. Now, three back-to-back publications in Nature Genetics highlight a prominent role of GRIN2A, probably the most counter-intuitive epilepsy gene ever found. The rolandic spectrum. The publications by Carvill and collaborators and Lesca and collaborators focus on disorders on the severe end of the rolandic spectrum. 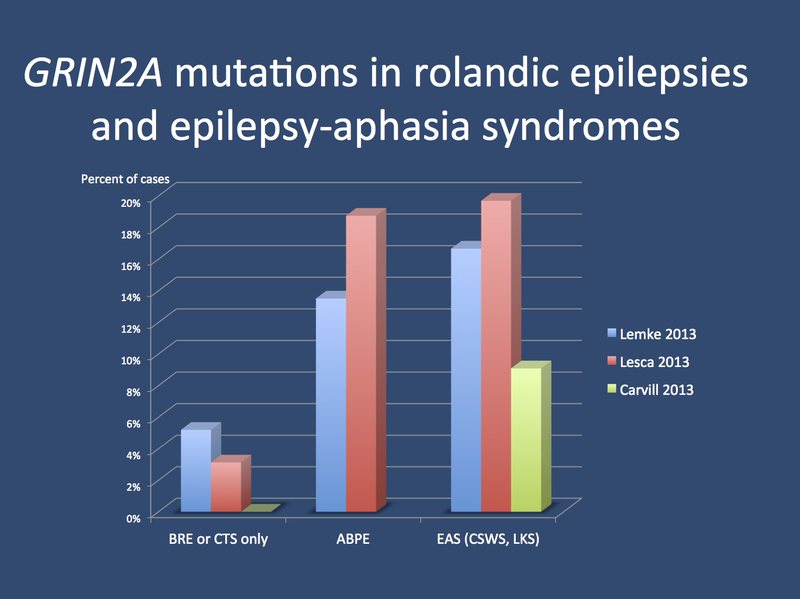 Both publications find mutations in GRIN2A in 9-20% of cases with atypical rolandic epilepsy or epilepsy-aphasia syndrome (EAS) including continuous spikes and waves during slow-wave sleep (CSWS) and Landau-Kleffner-Syndrome. Many of these mutations were de novo. The publication by Lemke and collaborators extends this finding to the broader spectrum of rolandic epilepsies and suggests that a spectrum of variants ranging from inherited variants to de novo mutations are risk factors for idiopathic focal epilepsies. The frequency of GRIN2A mutations in cases at the severe end of the spectrum is similar (18%) to the findings by Carvill and collaborators and Lesca and collaborators. In addition, Lemke and collaborators identified mutations in ~5% of patients with Benign Rolandic Epilepsy, one of the most common childhood epilepsies. Taken together, all three studies provide strong evidence that mutations in GRIN2A are a frequent cause of diseases at the severe end of the rolandic spectrum. There is some discrepancy between the three publications regarding the possible role of less severe mutations in milder, more common forms of Benign Rolandic Epilepsy. This, however, maybe due to the different fraction of familial cases included in the studies, which have a higher probability of an underlying GRIN2A mutation. In summary, the three publications suggest that GRIN2A is one of the most prominent genes for human epilepsies. Comparison of the frequency of GRIN2A mutations in the different phenotypes of the rolandic spectrum. All three studies find a high frequency in patients with Atypical Benign Partial Epilepsy (ABPE) and epilepsy-aphasia syndromes including Landau-Kleffner-Syndrome (LKS) and Continuous Spikes and Waves during slow-wave Sleep (CSWS). The studies by Lemke and collaborators and Lesca and collaborators also find GRIN2A mutations in patients with Benign Rolandic Epilepsy (BRE) or the EEG trait of centro-temporal spikes (CTS). GRIN2A and NR2B/NR2A developmental switch. GRIN2A codes for NR2A, a subunit of the NMDA receptor. NMDA receptors are postsynaptic glutamate receptors that allow for the influx of sodium and calcium into the postsynapse, which is essential for transmission of neuronal activity. Furthermore, NMDA receptors are crucial for synaptic plasticity, the molecular mechanism that underlies learning and memory. The importance of NMDA receptors in the postsynapse cannot be overestimated. Amongst other glutamate receptors, they are the key receptors for the main excitatory neurotransmitter in the CNS. The mutations and deletions in GRIN2A identified in patients with epilepsy-aphasia syndrome or other idiopathic focal epilepsies are likely to result in reduced expression or function of the NR2A protein. This is where the mystery begins, as it is unclear why a reduction of a receptor subunit involved in excitation results in epilepsy. One hypothesis might be that the composition of NMDA receptor subunits is altered including a relative excess of NR2B subunits. This, in turn, may lead to altered properties of the entire NMDA receptor. NMDA receptors with more NR2B subunits remain open longer, which is thought to correlate with increased plasticity of the Central Nervous System. During normal CNS development, the ratio of NR2B to NR2A is shifted towards NR2A, a phenomenon is called NR2B/NR2A developmental switch. It could be hypothesized that this developmental switch is delayed in some brain regions when a copy of the GRIN2A is missing, resulting in temporarily overactive NMDA receptors. A dysfunctional NR2B/NR2A switch might also explain why rolandic spikes usually disappear during development and are rarely seen beyond puberty. The idiopathic focal epilepsies are sometimes thought to be due to a hereditary impairment of brain maturation (HIBM). With the identification of GRIN2A mutations, this abstract concept may be translated into testable hypotheses regarding the molecular maturation of specific brain regions. The long road of gene discovery. Given that GRIN2A is such a common gene involved in idiopathic focal epilepsies, why did it take to long to find it? First, even though GRIN2A is a candidate gene, it was probably never thought to be a top candidate gene that was analyzed prior to the era of genome-wide screening methods. Secondly, the knock-out mouse model does not develop spontaneous seizures, suggesting that the idiopathic focal epilepsies are not readily translated into an animal model. The first study on GRIN2A was the publication by Reutlinger and collaborators. In this study, overlapping deletions involving GRIN2A were discovered in patients with atypical forms of rolandic epilepsies using array-CGH. Even though array-CGH or SNP arrays have become standard diagnostic tests, they are in fact genome-wide screening tools that can be applied without a prior hypothesis regarding the gene or region involved. The GRIN2A example shows that common genes for some types of epilepsy can be discovered using genome-wide screening technologies. GRIN2A encephalopathy. I have taken the liberty of using the term “GRIN2A encephalopathy” in the title of this post. In part, this was meant to be provocative. How are patients with GRIN2A mutations similar and what is the difference compared to patients with rolandic phenotypes without mutations? Do they have a common profile with respect to drug response and side effects to antiepileptic drugs? Given the involvement of the glutamatergic system, this might present a possible avenue for novel treatment options in patients with GRIN2A encephalopathy. It is very rare that a sizeable fraction of cases of a given disease is explained by a single gene. GRIN2A is one of these rare exceptions. The three publications are an important reminder that we should keep on searching for the cause of human epilepsies and that identifying the causative gene comes with the duty of translating this knowledge into treatment options. Disclaimer. I am a coauthor of the publications by Lemke and collaborators and by Reutlinger and collaborators. Therefore, this blog post is not an objective outside view, but also a personal interpretation and reflection. I hope that I have given sufficient credit to the publications that I was not involved with and would ask for your comment/feedback if you feel that I have misrepresented some aspects of the GRIN2A story. This entry was posted in 2013, Epileptic encephalopathy, EuroEPINOMICS, Familial epilepsies, Opinion, Papers and tagged aphasia, Benign Rolandic Epilepsy, BRE, centro-temporal spikes, CSWS, epilepsy gene, epileptic encephalopathy, ESES, GRIN2A, landau kleffner syndrome, Landau-Kleffner, LKS, NMDA receptor, NR2A, NR2B, slow wave sleep. Bookmark the permalink.